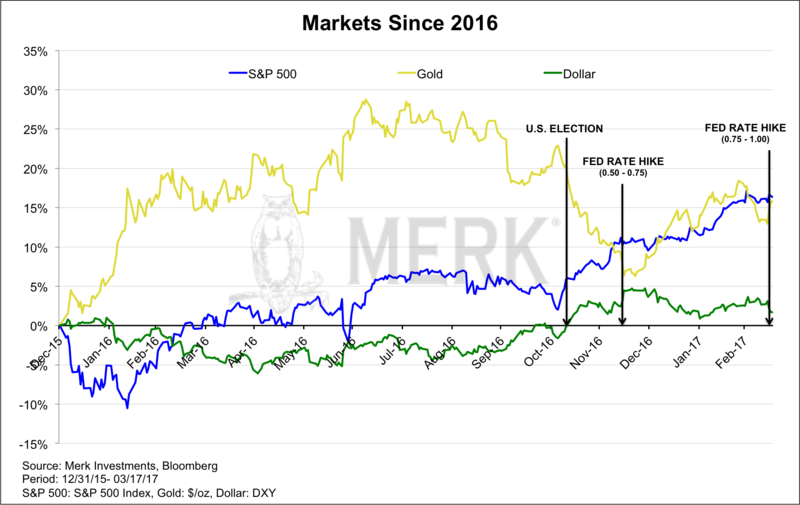 Merk Insights - What's next for the Dollar, Gold & Stocks? What’s next for the Dollar, Gold & Stocks? The chart above shows the S&P 500, the price of gold and the U.S. dollar index since the beginning of 2016. The year 2016 started with a rout in the equity markets which was soon forgotten, allowing the multi-year bull market to continue. After last November’s election we have had the onset of what some refer to as the Trump rally. Volatility in the stock market has come down to what may be historic lows. Of late, many trading days appear to start on a down note, although late day rallies (possibly due to retail money flowing into index funds) are quite common. Where do stocks go from here? Of late, we have heard outspoken money manager Jeff Gundlach suggests that bear markets only happen if the economy turns down; and that his indicators suggest that there’s no recession in sight. We agree that bear markets are more commonly associated with recessions, but with due respect to Mr. Gundlach, the October 1987 crash is a notable exception. The 1987 crash was an environment that suffered mostly from valuations that had gotten too high; an environment where nothing could possibly go wrong: the concept of “portfolio insurance” was en vogue at the time. Without going into detail of how portfolio insurance worked, let it be said that it relied on market liquidity. The market took a serious nosedive when the linkage between the S&P futures markets and their underlying stocks broke down. I mention these as I see many parallels to 1987, including what I would call an outsized reliance on market liquidity ensuring that this bull market continues its rise without being disrupted by a flash crash or some a type of crash awaiting to get a label. Mind you, it’s extraordinarily difficult to get the timing right on a crash; that doesn’t mean one shouldn’t prepare for the risk. If I don’t like stocks, what about bonds. While short-term rates have been moving higher, longer-term rates have been trading in a narrow trading range for quite some time, frustrating both bulls and bears. Bonds are often said to perform well when stock prices plunge, but don’t count on it: first, even the historic correlation is not stable. But more importantly, when we talk with investors, many of them have been reaching for yield. We see sophisticated investors, including institutional investors, provide direct lending services to a variety of groups. What they all have in common is that yields are higher than what you would get in a traditional bond investment. While the pitches for those investments are compelling, it doesn’t change the fact that high yield investments, in our analysis, tend to be more correlated with risk assets, i.e. with equities, especially in an equity bear market. Differently said: don’t call yourself diversified if your portfolio consists of stocks and high yielding junk bonds. I gather that readers investing in such bonds think it doesn’t affect them; let me try to caution them that some master-limited partnership investments in the oil sector didn’t work out so well, either. I have argued for some time that the main competitor to the price of gold is cash that pays a high real rate of return. That is, if investors get compensated for holding cash, they may not have the need for a brick that has no income and costs a bit to hold. After the election, we believe the price of gold came down as the market priced in higher real interest rates in anticipation of lower regulations. We indicated that this euphoria will cede to realism, meaning that regulations might not be cut quite as much. We also suggested that any fiscal stimulus on the backdrop of low employment may be inflationary. That is, expectations of higher real rates might be replaced with expectations of higher nominal rates; net, bonds might not change all that much, but the price of gold may well rise in that environment. Add the Fed to the picture, having raised rates twice now since the election. We have argued that the Fed is and continues to be 'behind the curve,' i.e. is raising rates more slowly than inflationary pressures are building. We believe the Fed is petrified that they might have to go down back to QE when the next recession comes and, as a result, has been very slow in raising rates. Indeed, we believe the Fed will only raise rates if the market delivers a rate hike on a silver platter, i.e. the markets are “behaving” (no taper tantrum). As such, let me make this prediction: if the S&P 500 is up 20% from current levels this October, odds are we will get more rate hikes than are currently priced in; conversely, if the S&P 500 is down 20% from current levels this October, odds are we will get fewer rate hikes than are currently priced in. If you are rolling your eyes that this isn’t too ingenious, I would like to remind readers that this isn’t supposed to be the yard stick the Fed should be using. We believe the Fed is a hostage of the market. Paraphrasing a former Fed official who shall remain unnamed, he indicated to me that the Fed wouldn’t care how the S&P reacts to an FOMC decision, unless, they created a bubble. What about the greenback? The dollar index (DXY) was up four years in a row. Year-to-date, however, the index is down despite the recent rate hikes. It shows that everything is relative to what is priced in already. A key reason we believe the dollar may have seen its peak is because of the Fed’s unwillingness to get ‘ahead of the curve’. Not with Janet Yellen, at least. Her term as Chair is running out next January; we wouldn’t be surprised if she is replaced with Kevin Warsh. He was a Fed governor during the financial crisis; he has since published a variety of OpEds, criticizing the Fed. He has also been on one of President Trump’s economic round tables. If he indeed succeeds Yellen (there are other names being mentioned; we just happen to think that at this stage, he best fits the profile of what Trump may be looking for), he has indicated that the reason why Fed officials are appointed for many years is so they don’t have to worry how markets react to policy decisions. That’s a stoic attitude, but reality (called “deteriorating financial conditions”) may well change his mind should he become Fed Chair and try to raise rates more aggressively. Aside from real interest rates, when it comes to the dollar, it is worth paying attention to trade policy. So-called experts had predicted a 20% surge in the dollar based on the “border adjustment tax” in the GOP House tax plan. Except that surge hasn’t happened. Maybe the plan is dead. Maybe the plan’s market impact will be different. Our take is: if you introduce barriers to trade, we believe currencies of countries with current account deficits tend to suffer. The greenback qualifies, and the recent decline coincides with more protectionist talk coming from the Trump administration. Talking about the greenback, there’s always another currency at the other side of the trade. The sterling is one of those currencies that has suffered as trade barriers have been raised (a “Brexit” is akin to increasing trade barriers); the Brits also have a current account deficit. And we think those trade barriers will become ever more apparent as the odds of the UK and the EU coming to a prudent trade agreement appear rather dim. We come to that assessment because of the EU’s institutional setup requiring unanimity for new trade deals on the one hand, but a hard deadline on the other hand to leave the EU once Article 50 (the ‘exit’ article) is triggered. What gets us really negative about the sterling, though, is their fiscal situation. Sure, there may well be a short squeeze at some point because others don’t like the currency but medium to long-term, we believe the Brits may well go down what we call the “Italian road.” That is, we believe they’ll finance substantial deficits with monetary policy that’s too loose, leading to a currency that will cascade lower over time. That’s because we don’t see how the Brits can finance their budgets. When the Brits had their austerity budgets, their finances had moved from what we would call horrible to bad. Now they may well drift back to horrible as government spending increases to cushion the blow from Brexit. What about the currency investors love to hate? Let me remind readers that everything is relative to what is being priced in. The euro has done well year to date because, we believe investors are increasingly realizing that the lows in rates may have been reached. The dollar started to surge at the first talk of tapering, even as the first actual rate hike was far, far, off. Similarly, the euro may well start appreciating well before rates will actually go up again in the Eurozone. Recently, European Central Bank (ECB) head Draghi gave an upbeat presentation at a press conference, suggesting (and I’m putting words into his mouth here) we shouldn’t be overly worried about the various upcoming risk events (Dutch election at the time; the French election, etc. ), as there isn’t much as we can do about them anyway; and if something bad were to happen, well, he’ll do whatever it takes. Then the Dutch rejected populism. Then the rumor came up that the ECB may hike rates before ending the purchases of securities; this rumor was given credence as the Austrian ECB member of the governing counsel suggested that there are many different rates and, yes, some could be raised before the bond purchases are done. Separately, we believe the euro has increasingly become a so-called funding currency. Amongst others because rates are so low, speculators are borrowing in euros to buy higher yielding assets. If we have a risk off event, e.g. a sharper decline in stocks, those speculators might have to reduce their bets and, as part of that, buy back the euro. Short covering may not lead to sustainable rallies in the euro, but it’s a piece of the puzzle worth watching. Emerging market (EM) currencies tend to be proxies for risk assets, i.e. they tend to do just fine when times are good, but in the case of severe selloffs, our analysis shows they also tend to suffer. We don't think they are as vulnerable as they have been at other times when investors have been chasing yield (remember, in EM markets, higher yielding bonds tend to be available), but any investors exposed to them should keep those risks in mind in the context of an overall portfolio allocation. Before you contemplate how to rebalance your portfolio, think about how institutional investors might be rebalancing their portfolio. U.S. markets have been outperforming, the dollar has been rising. As such, we would think institutional investors might shift assets overseas to rebalance their portfolios, thereby favoring international equities and putting downward pressure on the dollar. As you might have gathered, I believe most investors are over-exposed to US equities. Equities have performed so well that it’s difficult to get anyone to listen to this concern. And that’s exactly the type of environment that is a fertile ground for bubbles. Next time, we will be giving specific portfolio construction ideas for this environment. To be alerted, please make sure you subscribe to our free Merk Insights, if you haven’t already done so, and follow me at twitter.com/AxelMerk. If you believe this analysis might be of value to your friends, please share it with them. U.S. Dollar (DXY) Index: DXY is a measure of the value of the United States dollar relative to a static basket of currencies with Euro (EUR) 57.6% weight, Japanese yen (JPY) 13.6%, Pound Sterling (GBP) 11.9%, Canadian dollar (CAD) 9.1%, Swiss franc (CHF) 3.6% and Swedish krona (SEK) 4.2% weight. The DXY is a generally well-known measure of the value of the US dollar versus major foreign currencies, and as such makes a relevant reference point for directional currency strategies.